When it comes to baked goods, the more added fruit the better. No one ever complained about “too many fruit chunks” in their muffin, did they? The same philosophy can be applied to oatmeal. And by adding a generous portion of (insert your favourite fruit here), you’re lightening your porridge mixture, meaning you can comfortably dish out large portions. 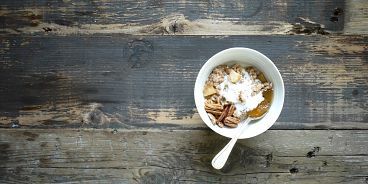 Here’s an Apple Cinnamon Oatmeal Recipe that’ll leave your tummy warm, full and happy. 1. Add oats, water and salt to a small to medium pot on the stove, bring to a boil, then reduce heat to low and cover to let simmer for 20 minutes. 2. Chop your apples into bite-sized pieces. 3. After ten minutes of simmering on the stove, stir your oatmeal and, if water and oats are at least semi-combined, add your fruit, spices and vanilla. Stir some more. 4. Once 20 minutes is up and your fruit is nice and cooked, remove pot from stove and serve with honey, pecans, coconut whipped cream and almond milk. I always enjoy a sprinkle of Himalayan salt on top, too.